Ya’ll! I named a cookie after myself. The name, Grubarazzi, elicits really good feelings about food. It also explains the feeding frenzy that takes place when you mush a lot of yummy things in to cookie dough. So I named these cookies filled with Snickers, Reese’s, M&M’s, and all things chocolate after me. Grubarazzi Cookies: a new treat using classic ingredients. 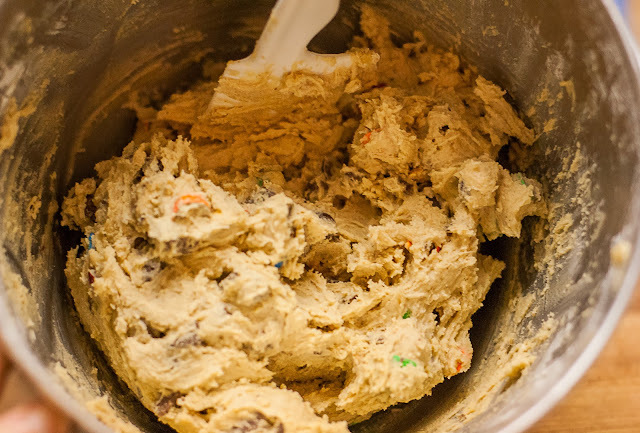 The cookie dough is perfectly soft and chewy a la Martha Stewart. She knows a thing or two about making the perfect chocolate chip cookie. I’m going to refrain from sharing my opinion about Martha as a human being, but I will say I hope my food pictures are better than hers, and I hope my cookies turn out like hers. It’s a love/hate relationship. These cookies are a great way to get rid of the leftover Halloween candy you are having a hard time resisting. Bring them to the office, or reserve them for your husband who never gains weight. They are great served warm and dipped in to a tall glass of cold milk. 1 cup roughly chopped Snickers and Reese’s (or any gooey chocolate candy you have on hand). Preheat oven to 350 degrees. In a small bowl, whisk together the flour and baking soda; set aside. In the bowl of an electric mixer fitted with the paddle attachment, combine the butter with both sugars; beat on medium speed until light and fluffy. Reduce speed to low; add the salt, vanilla, and eggs. Beat until well mixed, about 1 minute. Add flour mixture; mix until just combined. Stir in the M&M’s and Reese’s Pieces. With clean hands, place a tablespoon of dough in to the palm of your hand. Place one chunk of Snickers or Reese’s cup in to the middle of the dough, cover with more cookie dough, and roll in to a ball. Place each dough ball about 2 inches apart on baking sheets lined with parchment paper. 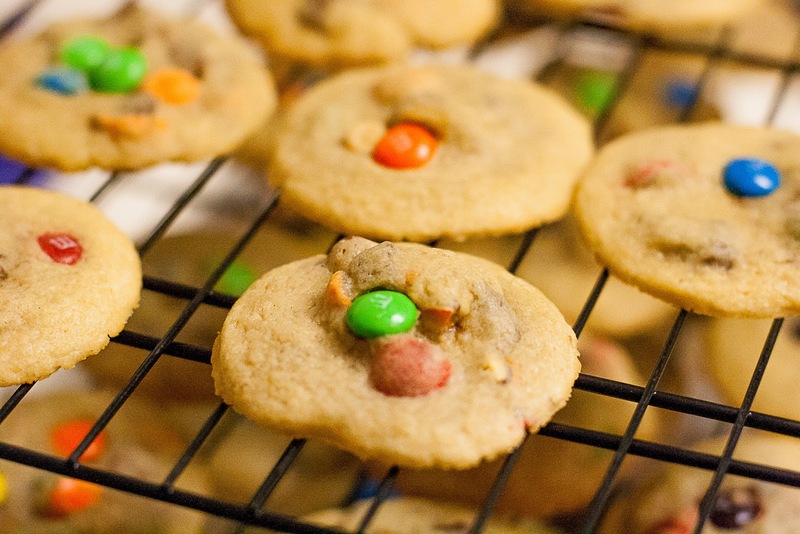 Bake until cookies are slightly golden around the edges, but still soft in the center, 8 to 10 minutes. Remove from oven, and let cool on baking sheet 1 to 2 minutes. Transfer to a wire rack, and let cool completely. Store cookies in an airtight container at room temperature up to 1 week. Brilliant! I think we all need a cookie named after ourselves! Love these! We're having a cookie exchange this year and I may just have to try making these. What to do about popping the candy in my mouth before I still up the ingredients though?!! I am going to try these, that is if I don't eat all the candy before mixing the dough! We're doing a cookie exchange this year and I may just beat Cindy with these chewy goddesses of deliciousness! Love the idea of naming a cookie after yourself. So, you, too, have a husband who can eat all the cookies he wants?!? And he especially loves soft cookies. I'll be saving this one. Hmmmm I can see a Grubarazzi cookie baking session in my near future. My 3 nieces will love these. The 12 yr old can mix, the 3 year old can add the candy, the 6 year old can cut them out. Auntie Hester can bake 'em and eat 'em! Have a wonderful Holiday Season, Kimmi ! Excellent idea to name of cookie after yourself! I am so doing it! Happy holidays dear Kimberly!